Who cares. Love the mini size and love the long awaiting mini update. Thank you Apple. It is annoying, but not all that big a surprise, the Apple Pencil was meant to be a Pro only feature, so now having it be a generation newer isn't bad. Keeping the Apple Pencil gen 1 around means they can add future iPhone support as well. Also, there kinda needs to be some distinguishing features in the Pro line besides four speakers, USB-C and a bit more screen. The Apple Pencil gen1 is still an amazing tool that revolutionized the storyboard and tablet-sketching industry and is way more than adequate for people like me who don't use one for a living. So it's perfect for the non-Pro iPad line. That said, I'd kind of like Apple to offer more first-party cases that include a place for the Pencil in the case. I've returned two lost Pencils to the coffeeshops where their owners left them behind, and I'll wager that's a common issue. One of my friends has managed to lose not one but TWO pairs of AirPods (HOW???). Heh. I bought a rubber case for my Pro and pencil one. The pencils snaps into a pocket on the edge. The case protects the back and covers what the Smart Keyboard doesn’t. Im happy the new Mini supports Pencil 1. My wife can use mine after she upgrades the Mini 2 and we dont have to buy another! The Pro has a lot more power. A12X in the pro iPads. The A12 in the new iPad air. The Pro has two processors. I don’t care about the iPad Air but the mini doesn’t have to be a cheap model. I would pay more for a mini sized pro iPad. ‘Lots of storage, best processor etc. would also benefit from waterproofing as in addition to my flight map app ForeFlight I use my mini for an e-reader. I have a mini 4 but have used up most of the storage. The pencil is a nice idea I have both a one and two, but don’t tend to use either. I don’t have with me when I need them nor are they charged if I manage to bring one along. Of course they only work with my pro model iPads and those are too big for most practical use. Might get my pencil 1 out to try and take down a clearance on my new mini, once I get it. It makes sense. The new Pencil is 30 dollars more. I balked. But I bought it anyway. So the iPad mini is now considered a ‘budget’ model? Give me a break. Apple had no problem increasing the price of iPhone through the roof... was disappointing to see old tech (touch ID included) remain in a refreshed model. Would be like buying a Tesla with hand crank windows. No thanks. I understand the reasoning, and I also firmly believe this opens the door for a new iPad Pro in the future. But what Apple should have done is released a "cradle" that could plug into the new iPads via Lightening, and could charge the second-gen Apple Pencil. To say it's "not compatible" is creating unnecessary fragmentation. 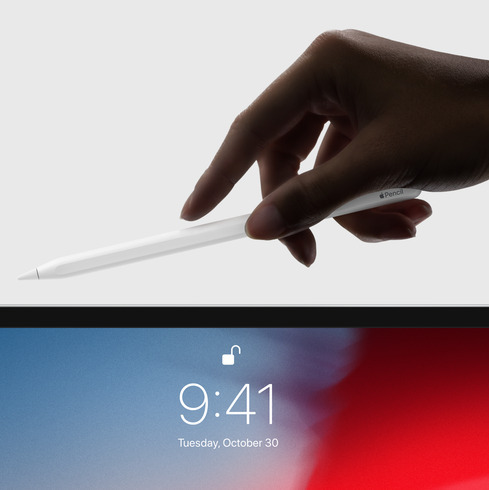 Does the second-gen Apple Pencil actually work with the new iPads, even if they can't charge it? Or is the pairing process entirely different? Enquiring minds want to know. Touch ID is not old tech. It's still the industry-leading capacitive touch fingerprint reader. People complain about prices going up. Apple delivers a perfectly-modern iPad and maintains the same great price, and suddenly they complain about it having "old" tech? Just can't keep people happy. Agreed - either that or made the old pencil compatible with the newer ipad pros. If you ignore the issues mentioned here, both iPads are capable of using both pencils, If I’m going to shell out $100 for a peripheral, it would be nice to have it compatible with more than one device. No one knows Apple’s production costs or profit margins. It’s hard to imagine that the hardware for the Pencil2 is that expensive. I’m guessing it was more the fact that they wanted to essentially stick a new logic board in the existing shell. I used to wish that Pencil support was given to the iPhone line-up. But thinking about it now, it would probably be awkward to use the Pencil, even with the XS Max. The iPad Mini seems like the perfect notepad size device for the Pencil. I would have picked up the new Mini in a heartbeat if I didn't have the iPad Pro on my list before it! I think there are definite use cases for adding Pencil support to the iPhone, and when you consider how large the iPhone market is compared to the iPad even a small percentage could add significant numbers to their Pencil sales. My guess is that it's not offered because the tech for digitizer is still costly to make it viable across an entire iPhone model. With the rising cost of iPhones in other areas and their drop in sales last year (which may have been mostly due to their battery replacement program) I have doubts that it would come this year, even though we're seeing the digitizer added this year to less expensive iPads, even though it's using the older tech that supports the original Pencil. Too expensive? Give me a break. It's a strategic decision to maximize profit. They could afford it, given their margins and cash they are piling up. They just don't want to [take the slightest hit in profitability]. Any quite frankly, as long as people [including me] keep buying their either outdated or great but overpriced technology - why would they? I bought a zippered neoprene pencil case with the original iPad Pro 12.9" and it's really the best storage solution. Just throw in the Apple Pencil, extra stylus, microfiber cloth, screen wipes, charger...etc., etc. The magnetic attachment capability with the Apple Pencil 2 and latest iPad Pros is handy for non-transit types of purposes, but I wouldn't really view it as "storage" like this article does. Whaha - too expensive !? With only one mini, I don't know if I'd categorize it as Good or Better though it's much better than the mini 4 and leaps and bounds over my mini 2. I'm not sure there's enough market to support an iPad Pro mini, but Apple would probably get my money. The 120Hz screen is gorgeous. At some point I'd like to see that as an across the board feature.